The other day I bought a sheet of plastic for $20 plus $5 shipping. I wanted a skill pad for practicing handling and shooting off the ice. Why? Playing with a ball or roller hockey puck isn’t quite the same as using a 6 oz ice hockey puck. Also, I’m tired of chewing up my stick blade whenever I want to practice ice. I know the shooting pads over at places like HockeyShot.com have advantages like a handle cutout and beveled edges so you can “ramp” the puck onto the pad, but I didn’t feel like spending that much money. 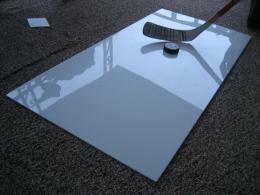 I’ve heard of other players using a sheet of plastic to simulate the ice, so I headed over to USPlastics.com to see what was available. I settled on a 24″ x 48″ sheet of high-density polyethylene (HDPE) plastic–item #42588. I threw a puck on the sheet, grabbed my stick, and messed around for awhile. It worked fine, but I really wanted a frictionless surface as close to ice as possible. I ran to the hardware store and purchased a can of silicone spray lubricant. After applying a light coat, the puck slid much better. I think this pad will do the trick. I have not used it extensively yet, so I can’t vouch for its durability, but it looks sturdy. I’ll let you know how I like it. Where do you usually go to practice shooting or stick handling? This entry was posted on on October 31, 2010 at on October 31, 2010 and is filed under diy. You can follow any responses to this entry through the RSS 2.0 feed. You can leave a response, or trackback from your own site. Are you considering gluing it to a piece of plywood so it lasts longer? I actually use a whiteboard with the frame taken off. your idea will probably give the same results. I haven't thought about attaching plywood…do you think it would last longer that way? @Greg: How did the white board work out? It seems like it would be too flimsy. I have a 6' by 2.5' piece of plywood I use for practicing shooting. The apartment complex I live in all grass around any good backstopping walls. I put this down and shoot from there with outdoor pucks. hello thanks for the idea i think im going to do what you did i have been looking at the shooting pad and they are really expensive but i really want to know how is it going with you pad you made did it really work and what are the pro and cons. thanks it would really help. Can you post a link of the exact item you ordered? I want to do the same thing. So, how did it hold up in the long run? Looks like an economical alternative. Please update. Holding up nicely. I have a bigger shooting pad I got from Hockey Train, and I’d recommend something like that for stick handling, but for shooting, the small one is perfect. I did the exact same thing for the exact same reason. It worked great at the start. Now I have taken 10000+ shots on it and whenever it’s in direct sunlight a huge bubble forms in the middle, making it unusable. I would recommend it for the less serious shooter or someone who doesn’t mind buying a new one at about every 8000 shots. Where I can find a shooting pad? How much it cost?